Archive by Category "P&TC Land Projects"
Adding a new view to Frontenac? Few outcomes are more satisfying than when a big-time polluter is caught in its tracks. This summer, one such polluter was brought to justice by the U.S Attorney’s Office when a whistleblower reported a ship was illegally dumping dirty bilge water into the Great Lakes. Part of the punishment included a $200,000 criminal sanction against the company that will be used to protect Lake Superior and its watershed. 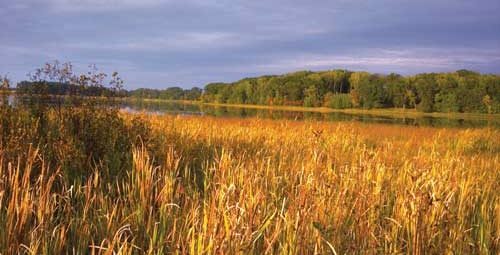 This fall, Parks & Trails Council of Minnesota, along with three other environmental nonprofits were awarded grants from this settlement. Like a puzzle, the newest segment of the Mill Towns State Trail involved many pieces fitting together—just so—to complete the picture. Talks began in 2010 between the DNR, three private landowners, two counties, managers of a dam and a highway. This year, with the commitment of trail proponents, the pieces came together to make a great addition to the state trail system.